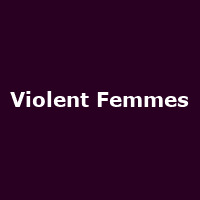 Violent Femmes are an alternative rock band from Milwaukee, formed in 1980 by current bassist Brian Ritchie and former percussionist Victor DeLorenzo. Albums include their eponymous debut in 1983, followed by "Hallowed Ground (1984), "The Blind Leading the Naked" (1986), "3" (1989), "Why Do Birds Sing?" (1991), "New Times" (1994), "Rock!!!!!" (1995) and "Freak Magnet" in 2000.